This document is drawn and maintained by qualified lawyers at Net Lawman. It is real law in plain English. The document is suitable to use for all construction industry trades and many others including plumber, joiner, electrician, painter/decorator, roofer, tiler, glazier, brick layer and plasterer where the tradesman is working in someone’s home. 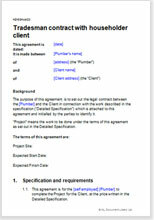 This document template has been kept simple so that you can use it even on a very small job. We have included terms that limit your liability for work not done, breach of agreement or accident, and protect you from excessive claims from the client for things you could not foresee. The confidentiality paragraph helps to prevent unhappy clients posting negative reviews about your business on social networks and forums. We have provided several payment options to make sure that you get paid what the client owes you for youra work, in full and on time. In case the client does not pay up-front, the contract contains alternative provisions for payment. Most importantly, the agreement provides the simplest framework to deal with the Building (Residential Consumer Rights and Remedies) Regulations 2014. We have included precise requirements and procedure. You can put this document to your client and say “This is what we have agreed. Sign here.” You do not want to be embarrassed in presenting ten pages of legalese. We are giving you a document you can re-format to print on two sides of A4. Net Lawman also offers a range of more comprehensive construction industry contracts at Building trades contracts and other consumer services at Contracts for services.